Robinsons Land Corp., the real estate development arm of taipan John Gokongwei Jr., is set to launch a twin-tower residential condominium project within the next three months, its fifth project in the upscale Bonifacio Global City in Taguig, said Mybelle V. Aragon-Gobio, RLC vice-president for business development. "It will be called St. Regis, a name synonymous to luxury and timeless elegance," said Frederick D. Go, RLC president and COO, adding that the units will cost a minimum of P5 million each. St. Regis will be located along Global City’s millionaire’s row, in a 9,118-square-meter lot at the corner of McKinley Drive and Fifth Avenue. Planned as the "lifestyle gateway" to Global City, the lot is composed of two mega-block lots — the first measuring 5,747 square meters, and the second block measuring 3,371 square meters. "The property is seen as the last remaining premier lots with superior vantage point in the whole Global City complex. 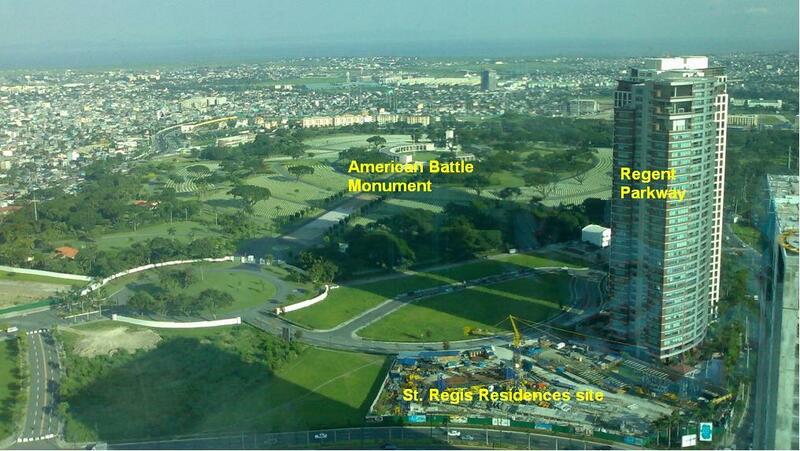 It has a spectacular view of Manila Golf and Manila Polo Club," Go said. RLC had sold-out three projects in Bonifacio Global City. These were the 38-storey Fifth Avenue Place, the 43-storey Mckinley Park Residences and the 43-storey Fort Residences. RLC is preselling its fourth project, the 49-storey The Trion Towers. RLC is a major player in the property market and boasts of a growing portfolio now composed of 20 shopping centers, 23 residential condominiums, five office buildings, 27 housing and land developments, and three hotels. LISTED PROPERTY developer Robinsons Land Corp. is set to launch its fifth high-rise condominium project in the upscale Bonifacio Global City in Taguig within the next three months. Mybelle V. Aragon-Gobio, Robinsons Land vice-president for business development, said the company is scheduled to unveil a twin-tower residential project by the second quarter of this year. Frederick D. Go, Robinsons Land president and chief operating officer, told BusinessWorld in an interview Thursday night that the company envisions a "luxury" project, with units costing a minimum of P5 million each. "It will be called St. Regis, a name synonymous to luxury and timeless elegance," Mr. Go said. RLC has commissioned Arquitectonica and the Philippines counterpart will be the WV Cosculluela. It will the most upscale project that RLC will be launching. Arquitectonica is known for its distinctive design for every project, which means they are not repeating the same design again for a particular project. 1-BR around 60 to 70 sq mtrs at 8 units to a floor. 2-BR around 120 to 150 sq mrs at 6 units to a floor. 3-BR around 150 to 180 sq mtrs at 4 units to a floor. Penthouse is 350 sq mtrs. - No initial selling right now, we'll announce later.